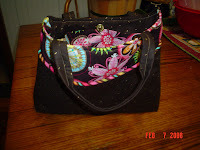 I completed another purse. This is the second one I have done. They are so easy to make! I have plans for several more. If you like them and want to order one, let me know. It's my favorite so far.